Hydrogen water is quickly becoming the most practical application today for better health. For one thing, there have been over 500 peer-reviewed articles demonstrating hydrogen to have therapeutic potential in essentially every organ of the human body. 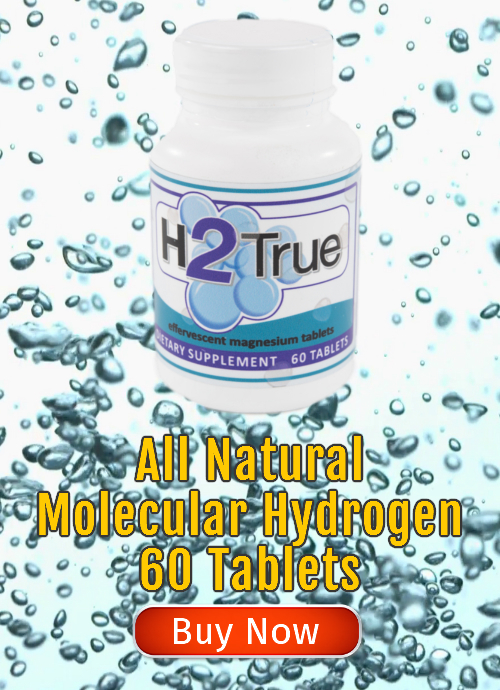 Hydrogen rich water is simply water that has been infused with additional hydrogen gas molecules (H2). You can drink it and bathe in it for its therapeutic benefits. In fact, documented “healing” or “curative” waters around the world contain naturally dissolved hydrogen gas. The waters of Nordenau Germany; Tlacote, Mexico; Nadana, India; and Hita Tenryou Sui (Mineral Water) drawn from the Hita basin in Japan are but a few. What Makes Hydrogen Water So Effective As A Health Benefit? Hydrogen water is effective for a few reasons. One, hydrogen (H2) is the smallest molecule in the universe and this extremely small size and its high lipid solubility (ability to dissolve in lipids, fats, or oils) allows it to easily enter into the subcellular tiny compartments of the cell mitochondria and other locations in a cell. Since molecular hydrogen (H2) can easily diffuse into the subcellular compartments, it reduces the levels of cytotoxic oxygen radicals (free radicals) and protects the DNA, RNA and proteins from oxidative stress (the imbalance between the production of free radicals and the body’s ability to counteract or detoxify their harmful effects). Free radicals are usually the basis of the body’s imbalance. They are groups of atoms with an odd (unpaired) number of electrons and can be formed when oxygen interacts with certain molecules. This sounds innocent enough, but once created they continue in a chain reaction growing and growing as they search for more electrons to become even. This is where damage occurs as they are now “electron stealers” – stealing electrons from other cell membranes and even our DNA. Antioxidants are electron donors and free radicals are electron acceptors – they lack a paired electron. The human body absorbs dietary antioxidants, such as vitamin C and E and produces its own endogenous antioxidant enzymes – superoxide dismutase, catalase and glutathione peroxidase found in every cell. These antioxidants quench free radicals and help prevent oxidative stress episodes caused by excess free radical production overwhelming the body’s antioxidant defenses. Another benefit of molecular hydrogen is that it is an antioxidant that also triggers the activation of additional antioxidant enzymes (e.g. glutathione, superoxide dismutase, catalase, etc.) and/or cytoprotective proteins of the body. It actually helps the body fight against cellular damage. However, not all free radicals are harmful and we don’t need to neutralize all of them; and this is where the benefits of hydrogen gas come in. Molecular hydrogen is a selective antioxidant because it only targets the destructive highly toxic free radicals in the body and leaves alone the good free radicals like nitric oxide which is needed for healthy artery vasodilation. So, you can see how extremely helpful hydrogen water can be. Drinking, bathing, or showering in it can be simple ways to allow it’s therapeutic benefits to get into your body and get to work flushing out the damaging free radicals and helping to restore the body to optimal health.